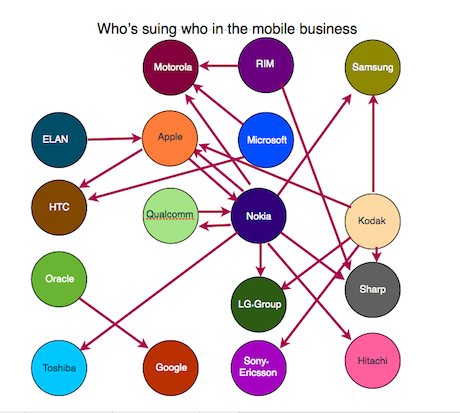 How do you identify players in the mobile phone industry? They get sued for patent infringement. See article for the gory details. Picture below from the article. One of the problems with choosing a sanctimonious corporate motto like the one above (which may be loosely derived from the Hippocratic Oath) is that it opens you up to charges of hypocrisy when you inevitably fall short. After years of fudging the oath to comply with the dictates of the Chinese security state Google pulled back to a chorus of applause. Now in one stroke Google has squandered that goodwill with its disastrous launch of Google Buzz. The arrogance of the implementation of Google Buzz is breathtaking. New users of Google Buzz found that Google preselected a list of contacts based on the people with whom they communicated with the most on Google mail and chat. See link. Also see here. Did the testers for the product not see the obvious flaw in the procedure and how Google’s presumptuousness was likely to piss off people? Privacy concerns with social networking sites are hardly new. Its only been a couple of months since there was a brouhaha about Facebook’s new options to reset privacy settings. See link. For suggestions to enhance your privacy on Facebook see here. An example of the privacy maelstrom Google kicked up see this expletive laden blogpost from a blog dedicated to women’s violence issues (the blog itself appears to be offline). Also as Evgeny Morozov in Foreign Policy points out Google’s new system could be manna from heaven for authoritarian regimes hunting down dissenters. See link. With Google’s Orkut not having a huge following in the United States, Google appears to have tried to jump start its new networking tool to allow it to catch up with Facebook and others. See link. Google is right in how tedious it is to populate a new list of friends on a new social network. The proliferation of these sites makes it very difficult to follow all of them and most users trim the amount of sites they follow. But Google should still have given people the choice whether they wanted to toss their privacy to the winds (something Facebook in its pursuit of Twitter and a positive revenue stream needs to remember as well). The brouhaha makes me glad that logistical reasons prevented me from switching my primary email use to my gmail account a few years ago. Rupert Murdoch is continuing to fire away at Google. So far it is all talk and no action. The media baron is stymied by the change brought about by the internet that had upended journalism’s traditional revenue model. It is hard to see him actually take Fox News off search engine sites that drive traffic to his websites. Others like Mark Cuban think he may be on to something. The problem is that many newspapers like the New York times have tried and failed to get subscribers to pay for content. The Wall Street Journal with its unique business following is one of the only “old media” outlets to succeed with this model. I tend to agree with Matt Ingram, a link to a site that requires subscription or worse payment is likely to send me scurrying in search of alternative news sources. An interesting New York Times article on Google’s latest challenge to Apple. It will be interesting to see how these technological giants rumble in the future and whether they can recover their previous cooperation. It is interesting to see how other giants like Microsoft and Nokia (in the interests of disclosure love my Nokia phone and have no desire to switch to the iPhone) respond. With the PC market maturing rapidly, Microsoft needs to expand beyond its excessive reliance on Windows licensing revenues.